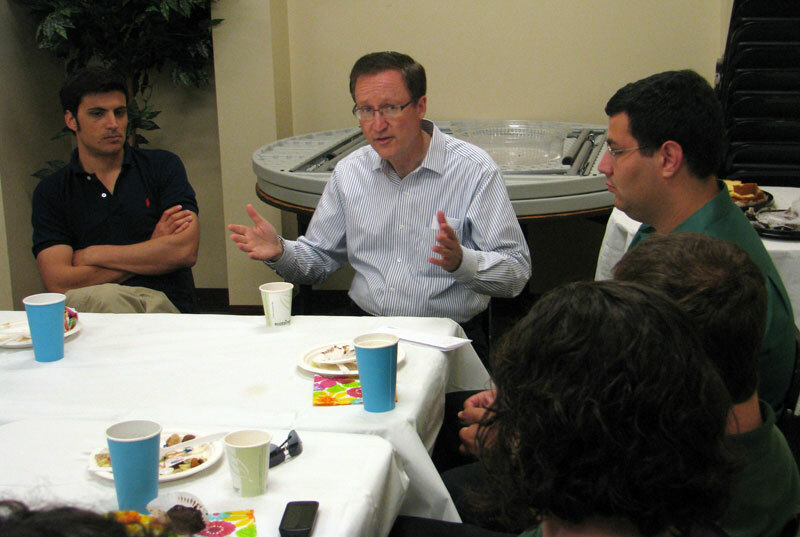 Nine Hebrew University students engaged a prominent MetroWest rabbi in a lively discussion of the similarities and differences between American and Israeli Jewish identities in a July 25 visit to Congregation Agudath Israel of West Essex in Caldwell. The students, who are preparing to become the next generation of Israel’s civil servants, are visiting the United States and Canada to take a close-up look at government operations away from their home country. They are part of “Atidim” (the Hebrew word for “futures”) a program sponsored by the Israeli government and an NGO. The eight Jewish and one Arab Israeli — who immigrated following the Israel Defense Forces’ withdrawal from southern Lebanon — divided their time among meetings with federal, state, and local government officials and leaders of the Jewish community. 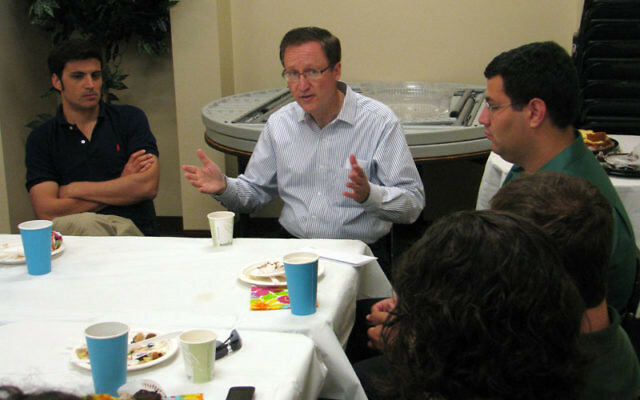 Over lunch at the Conservative synagogue in Caldwell their focus turned toward the contrasts and commonalities of the Jewish communities in Israel and the United States. “One of our goals is to learn about the Jewish community here and there,” said Atidim’s program director, Sarit Milman. “We believe the future civil servants should understand this. It should be about Jewish identity in both places. Here in the States, you deal with Jewish identity, but in Israel it is taken for granted. It should not be. It is not only about the calendar and going into the army, especially for secular Israelis,” Milman said. As she and the “cadets” she is supervising sat around tables in a conference room, they took part in a lively discussion of the many facets of Jewish identity with the congregation’s Rabbi Alan Silverstein and members of the Legow Family Israel Program Center of United Jewish Communities of MetroWest NJ. “Here we ask the same question: Are you an American first or a Jew first?” said IPC chair Lisa Lisser of Short Hills. “You live in a Jewish state, so it is a little easier because you don’t have to practice your religion to be a Jew,” she said. Although at Agudath Israel there are “hundreds of people who come, and we have tefilot every morning and every evening,” he said, the congregation plays a host of other roles. “We have a talmud-Torah. We have a teen department. We have adults involved in Jewish learning on a regular basis. We have all kinds of social action projects. We have all kinds of opportunities to build relationships…. In fact, Silverstein said, “for people not connected to synagogues, the long-term prognosis for passing along Jewish identity — it can happen, but the percentage is very low. “The synagogue is the anchor to Jewish identity. If you bypass the synagogue…you do it at your own risk. In Israel, you can be Jewish even if you don’t belong to a synagogue,” he added. “Aren’t you giving up on quite a lot of secular Jews if the Jewish life would not be connected to synagogues?” asked one of the non-religious Israelis. The visitors were the sixth cohort of Israeli civil service cadets to visit the United States, the first to spend time in MetroWest. Prior to coming to New Jersey on July 22 they spent a week in Washington, DC, meeting with representatives of the World Bank and the Department of Homeland Security as well as aides to senators, House members, and representatives of the Obama administration. They are scheduled to go to Toronto July 29. The Israelis also visited city officials in Newark, met with American-Jewish young people, and received an overview of the organized American-Jewish community from Arthur Sandman, executive vice president of the Jewish Agency for Israel in New York, immediate past associate executive vice president of United Jewish Communities of MetroWest NJ.